Today I found out the cotton candy making machine was co-invented by a dentist, who later became the President of the Tennessee State Dental Association. Coincidence? While candy floss / cotton candy-like spun-sugar confectioneries have been around since at least the 15th century, if not earlier, it’s only been recently that cotton candy has been something practical to make and sell. So despite the fact that the amount of sugar itself in a typical serving of cotton candy is quite small, only about 30 grams or about 2 tablespoons, the time consuming handmade production of it and how quickly it loses its fluffy nature when exposed to air made it something that wasn’t well known or eaten except by certain wealthy individuals. 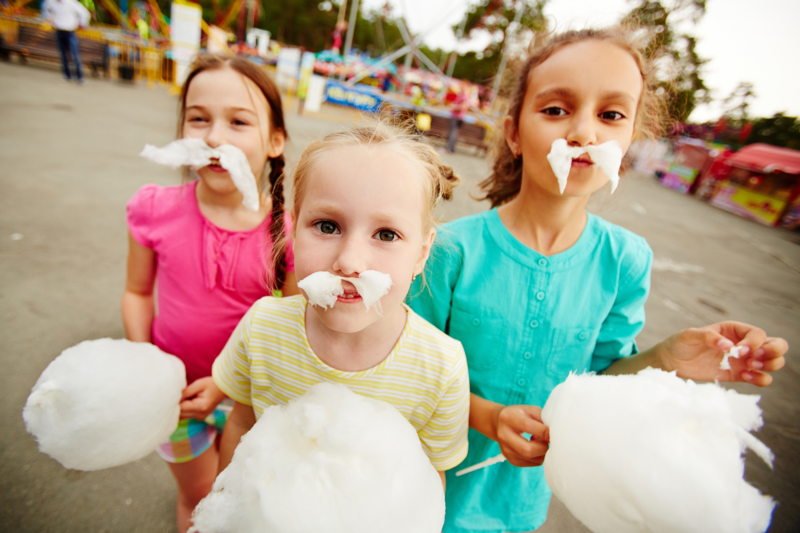 Cotton candy reached its current form and became accessible to the masses thanks to the efforts of Dentist William Morrison and candy maker John C. Wharton in 1897. That year, the two got together and invented an electric machine that would first melt crystallized sugar, then spin the melted sugar such that it would be forced through tiny holes in a screen, which would create the threads of cotton candy. These threads could then be collected into a container. In their case, they sold them initially in small chipped-wood boxes. This entire process could be done quite quickly and easily, which is essential when selling cotton candy as it’s hygroscopic and has a very large surface area, so gathers moisture from the air quickly causing it to lose its fluffy texture, turning into sticky/coarse strands, particularly in humid regions. Sold for 25 cents a box or about $6.65 today (a huge profit given the tiny amount of sugar per box), the cotton candy was a huge hit with the two selling approximately 68,655 units at the fair, so $17,163.75 worth ($456,000 today) over the course of the seven month event. Given that the average annual salary in the U.S. for an individual was about $450 at the time, they did OK with their $2500-ish per month gross. As a side benefit, one would assume Morrison’s dental practice may have been helped a bit by this, although not as much as the next cotton candy making dentist who specifically targeted his own patients when selling the confectionery. That dentist was Josef Lascaux, who also independently invented his own machine for making cotton candy. Rather than sell it to the masses, he first simply started selling it at his dentist’s office. When exactly he started doing this isn’t entirely known, but it is generally thought it was at least a decade, if not close to two after Morrison and Wharton. That said, while Lascaux probably wasn’t the first to invent a cotton candy making machine, he is generally credited for giving it its name around 1921. In the 17 years since its widespread introduction at the World’s Fair, it had been called by the name Wharton and Morrison had named it, “Fairy Floss”. But in the 1920s, Lascaux’s name for it, “cotton candy”, became much more popular with “fairy floss” slowly dying out in popular use. You may also sometimes read that the first cotton candy machine was actually invented by Thomas Patton. He supposedly beat out Morrison and Wharton by a few years, debuting his cotton candy machine at the Ringling Bros. Circus, in 1900. However, while Patton really did invent a cotton candy machine (using a gas-fired, rather than electric machine, with a spinning plate and fork used to gather the strands), his was patented in 1900, whereas Morrison and Wharton’s was patented in 1899. While it may seem like something made of pure sugar (sometimes with food coloring or other flavoring added) would be pretty much the worst thing in the world for you to eat, it should be noted that it only takes about 30 grams of sugar to make a typical serving size of cotton candy, which is about 9 grams less than a 12 ounce can of Coke. Further, cotton candy has no fat, no preservatives, nor sodium and is about 115 calories per serving. While certainly not a health food, nor filling in any way, there are numerous things people consume every day that are much worse for them health-wise. What’s going on scientifically to make cotton candy is that as granulated sugar is heated sufficiently, the chemical bonds that hold together the crystal are broken down. When this happens, the crystals are split into fructose, glucose, and sugars. If you continue to heat this, these will further break down into carbon, hydrogen, and oxygen, with the hydrogen and oxygen then combining to form water. If you continue to heat this substance from there, the water will evaporate and the carbon will start to burn. Before this happens (before the water evaporates), you can use the solution to make cotton candy by extruding fine hairs of the stuff through tiny holes in a screen, or as 15th century pastry chefs would do by pouring some of the syrup onto small handles and working it into threads of spun sugar. Tootsie Roll of Canada Ltd. makes the most cotton candy of any company in the world today. You’ll often see their product sold in stores as “Fluffy Stuff”. December 7th is National Cotton Candy Day in the United States. Cotton Candy’s next big breakthrough after Wharton and Morrison’s machine happened in 1972 when the first fully automated machine was invented which could produce and package cotton candy in water-tight containers. This has since made cotton candy much more widely available. Today there are also vending machines, invented in 2009, that can produce and distribute a single serving of cotton candy on demand. Almost all cotton candy machines made in the world today are made by one company, Gold Medal Products, in Ohio.